Mosler was a $1,050,000 Keeneland Yearling. He won stakes in New York and Maryland. He bred 102 Mares in his first season at stud, in 2017. Country Life Farm stands this big, handsome black stallion in a partnership with Claiborne Farm’s Seth Hancock and their longtime patron Mrs. Adele Dilschneider. Mosler is inbred 2-x-4 to Danzig, a great source of speed. 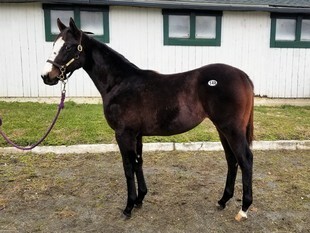 We think Mosler will be Maryland’s Leading Freshman Sire of 2020. 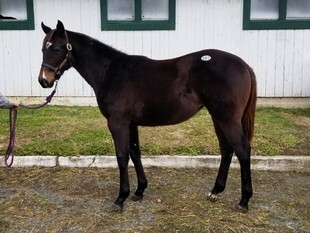 We just bought two Maryland-bred weanling fillies in his first crop: For $15,000, we bought his very first foal, a Jan. 5 filly out of a stakes-placed mare named Touch the Birds. We’ve named her: Mosler’s Touch. We also bought a $13,000 filly out of a Deputy Minister mare named Imagistic. We named her: Mosler’s Image. $41,900 / 10 shares = $4,190 annually divided by 12 mos: $349 Monthly Expenses per 10% share. We spent $28,000, plus sales tax, to acquire these two fillies. In this $30,000 Offering, Country Life is buying the first 10% share, at $3,000, and offering 9 shares at $3,000. Estimated monthly expense in 2019 for the Mosler Girls LLC is $349 per 10% share. Country Life buys first 10% share; Offers 9. LLC begins on Jan. 1, 2019.